We consider the well-known problem of the forward computation of the gradient of the gravitational potential generated by a mass density distribution of general 3D geometry. Many methods have been developed for given geometries, and the computation time often appears as a limiting practical issue for considering large or complex problems. In this work, we develop a fast method to carry out this computation, where a tetrahedral mesh is used to model the mass density distribution. Depending on the close- or long-range nature of the involved interactions, the algorithm automatically switches between analytic integration formulae and numerical quadratic formulae, and relies on the Fast Multipole Method to drastically increase the computation speed of the long-range interactions. The parameters of the algorithm are empirically chosen for the computations to be the fastest possible while guarantying a given relative accuracy of the result. Computations that would load many-core clusters for days can now be carried out on a desk computer in minutes. 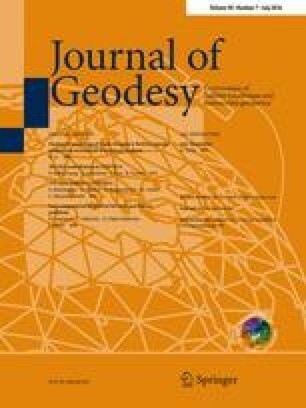 The computation of the contribution of topographical masses to the Earth’s gravitational field at the altitude of the GOCE satellite and over France are proposed as numerical illustrations of the method. The authors wish to thank CNES for financial support through the TOSCA Committee, and INRIA for providing the sources of Scalfmm.